In Manipulate each player is power hungry and trying to make it in the big city. You win by having the most “Power” at the end of the game. But you need to watch out; everyone else has their own agenda too. There are many types of Ventures which can earn you income and Power. Setting up Ventures costs you money, but with the extra income you receive each turn, you can quickly expand your empire further and progress along the road to Power. Successful people don’t make it to the top by playing nice. Make deals to make money. Make deals to get an edge. You can make almost any deal from loaning each other money at sky-scraping interest rates, to trading Ventures to agreeing ceasefires. Be creative with your deals. Favours grant you the ability to attack other players and defend yourself by using your shady entourage. Steal Ventures out from under your rivals, run smear campaigns to reduce their Power or even give yourself a cash boost. Favours give you a host of exciting actions to play and in some instances can be bluffed to further manipulate other players. They say the road to Power is paved with good intentions and some Favours offer a shadier path, but their use may come back to haunt you. If a Favour is illegal, like arms dealing or expenses fraud, (denoted by the skeleton symbol) playing this card will cause you to receive a "Skeleton" in your closet. These must be closely guarded as if uncovered, will cause you to lose Power, cash... or both. 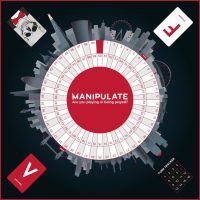 Add a Review for "Manipulate"